Pioneer Electronics (USA) Inc. Professional Sound and Visual Division redefines the DJ experience today with the announcement of its new CDJ-850 digital media player, inspired by Pioneer’s cutting-edge professional CDJ series for the next generation of DJ entertainers. The CDJ-850 player adopts many of the technical advances made in the industry standard pro-series versions and invites all levels of DJs to create, perform and share mixes like a professional. Pioneer is dedicated to bringing DJs the best audio/video and live performance products. For newer DJs looking to elevate and greatly enhance their performance and creativity, Pioneer’s CDJ-850 delivers enhanced mixing features, excellent audio quality and a new platform for them to share their music. “With the increasing popularity of the DJ art form and culture, we understand the importance of creating products for all levels of DJ skill sets. Our aim with the new CDJ-850 is to ensure that DJs get to enjoy similar innovative features and design to those found in our flagship CDJ-2000 and CDJ-900 players, and get to experience the best product for their needs,” said David Arevalo, senior marketing manager, Professional Sound and Visual division for Pioneer Electronics (USA) Inc.
· Pro-series Design & Exacting Features – Inheriting the club standard layout and precise control features of its professional CDJ series, the CDJ-850 integrates a large 206mm jog dial for continuous free and easy control along with a rotary selector and browse buttons integrated within the display. · Compatible Media and Formats – Users can mix a variety of music formats and media, as the CDJ-850 is compatible with MP3, AAC, WAV and AIFF digital audio formats recorded on USB storage devices or CD-R/RW discs. · USB Export Capability – DJs using the rekordbox software can easily export their music files and custom managed data onto a USB device and quickly plug in directly to the CDJ-850 and access tracks without the need to be linked to a PC. Play histories on the CDJ-850 are automatically recorded onto rekordbox via connected USB device for the DJ’s next session which makes the cycle of music file management, DJ play and preparation for future sessions very simple. · User Interface – The display and user interface of the player is designed for quick and fluid music selection. Combined with its rotary selector, navigation through music lists (title, artist, BPM, etc.) is extremely fast and easy. The WAVE display enables smooth DJ play because the user can visually analyze the flow and dynamics of the entire song. · DJ Software Control and Audio Interface – The CDJ-850 multi-media player features MIDI, enabling control of various DJ software running on a laptop. With the use of the built-in USB HID interface, the CDJ-850 can also control more complex operations of DJ software without the need for a control disc. For additional versatility, the player can also be used as a PC audio interface. · Tag List Function – Equipped with an editable Tag List functionality, users of the player can easily register tracks during play or preview to add to their playlist queue. The song order in the Tag List can be altered and saved as a playlist in rekordbox. 1. Auto Beat Loop function creates a beat loop with a touch of a button. 2. Four levels3 of settings can be made for the maximum variation range of a song’s tempo (±6%, ±10%, ±16% and WIDE). 3. Resume functionality plays music from where it was left off when removed and later reloaded. 4. Excellent vibration-resistance due to built-in Shock-Proof Memory4 and Floating Architecture. 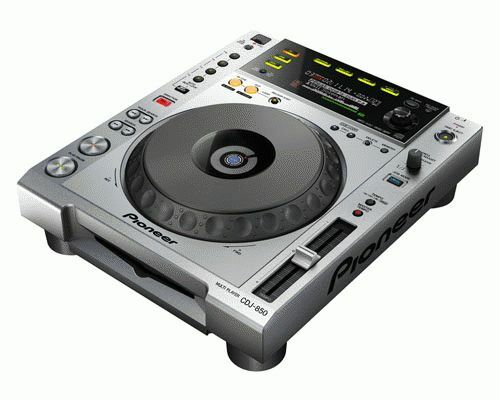 The Pioneer CDJ-850 will be available in August 2010 with a suggested retail price of $999.